VidBlaster is produced by CombiTech, a Netherlands based company owned by Mike Versteeg, who has been developing software for over 15 years. Programs like Mscan Meteo, Mscan SSTV, StudioRack and WinPodder all have high quality and ease of use in common. 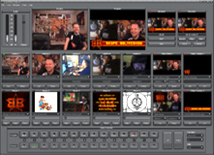 VidBlaster is an innovative software vision control system for Windows PCs that emulates many of the functions found in a TV studio or OB production control room video mixer. It is highly modular, allowing a wide variety and number of video sources to be combined together. The program output can be encoded directly and streamed to various on-line services, linked to 3rd party encoders like the Adobe Flash Media Encoder, and/or archived to disk. As such, it is an ideal production tool for streaming live video for webcasts, webinars, product launches and live events in general. The input modules include Camera modules to allow input via 1394 & USB video converters, or capture cards like those from Blackmagic, Magewell & Viewcast. Input from IP video cameras is also supported, as well as being able to screen grab from any defined area of the PC's own display. With multiple display monitors connected, it is therefore possible to include any sort of PC content in the broadcast, including web pages, presentation graphics & slides, or the user interface of other software. The other main type of source module is the Player, a virtual-VTR which can load either still images, audio or video files, or the AudioPlayer which just plays sound files. 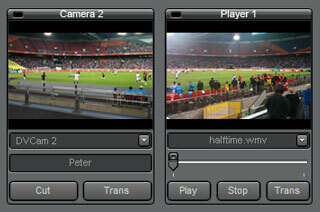 A Playout module can be used when a number of video files are to played in succession, with no other user intervention. Moving on from the video source modules, there is an Effect module for DVE effects & ChromaKey, an Overlay (cap-gen+DSK) module for title graphics, a dedicated two-team Scoreboard module for generating on-screen match scores, and an instant Replay video module. Multiple instances of all these modules can be generated (up to the limit of the particular VidBlaster edition), allowing any number of permutations of cameras, players, effects and overlays to be created. Switching between sources can be carried out by clicking the Cut or Trans button on each module, or on the higher editions there is a two bank Switcher module with separate monitor window for the preview bank. 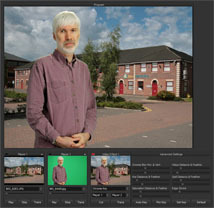 In some editions the Program/Preview displays can be routed via an Output module to an external PC display, if available, or to the video output of a Blackmagic card (or USB3 device like the Intensity Shuttle). An Audio module allows adjustment of the input level and an on-screen level display, although all audio mixing must be carried out externally (we can help and advise on this too). The remaining output modules are the Streaming and Recording modules, the latter generating a video file on the local disk in either compressed or uncompressed format. The streaming module will either encode directly for services like UStream, link to Adobe FMLE, or emulate a video source that can be used as an input to other encoding software running simultaneously on the same PC. As such, it is advisable to use a fairly high-spec PC like an i7-based workstation, which we can build and configure for the purpose*, if required. We can help you put together complete video production facilities based around VidBlaster, from building the PC, installing the video input devices to setting up the external audio mixing and routing connections. We have experience of both studio and OB environments, and help configure the system for your specific video production requirements, and then provide training in its use, or even supply freelance operators when required. We may also be able to offer "wet hire" should you wish to see a full VidBlaster system in a "real-world" test before purchase. We have a demo system at our Salford base, and you can also download a trial version. Suitable video input cards for use with VidBlaster include Blackmagic, Magewell & Viewcast Osprey, although we can supply and advise on other capture hardware that can be used with VidBlaster, including USB and 1394 adaptors and the Teratek Cube on-camera video streaming device.